That stood as a bit of understatement on a day during which Castroneves (1) topped the Carburetion Day practice sheet, (2) won the Indianapolis 500 Pit Stop Competition with his Team Penske crew and (3) learned that the final conspiracy charge stemming from his federal tax evasion trail had been dropped. All that remains for Castroneves this month is to win his third Indy 500 from pole position. For the record, Castroneves posted a hot lap of 223.920 mph to edge Penske teammate Will Power, at 223.560 mph, for fastest speed around the 2.5-mile oval during the final one-hour practice. A few hours later, Castroneves, chief mechanic Rick Rinaman and the five-man over-the-wall crew of the No. 3 Dallara/Honda won the Pit Stop Competition over Marco Andretti of Andretti Green Racing. Castroneves and Co. completed the required refueling/four-tire change stop in a record 7.962 seconds; Andretti’s crew posted a 9.465. Castroneves was supposed to join Power for a short news conference after their chart-topping practice performances. But in an uncharacteristic move, Castroneves declined to attend. The reason why came to light during his post-pit stop news conference, when Castroneves disclosed that he learned of the favorable conspiracy decision moments before practice began at noon. On April 17, a federal court jury in Miami acquitted Castroneves and his sister, Katiucia, of six counts of tax evasion but was unable to reach a verdict on one count of conspiracy. Attorneys Roy Black and Howard Srebnick, who defended Castroneves, Katiucia and business manager Alan Miller against the tax evasion charges, said it was right for the government to drop the case completely. Srebnick said the government’s move was not unexpected. “It would not have been logical to proceed on a charge of conspiracy to evade taxes when the jury has already found that there was no tax evasion,” Srebnick said. Asked to comment about the outcome, Castroneves – seated between Penske Racing president Tim Cindric and Rinaman – paused for a long moment. Rinaman termed the Pit Stop Competition far from routine, despite his team’s run of success. Castroneves’ team qualified No. 1 at 8. 122 seconds, then defeated teammate Ryan Briscoe in the semifinals with a 7.636. The victory was Team Penske’s 11th in the competition, most in the history of an event that dates from 1977. Team Penske has won the last four in a row, starting with Sam Hornish Jr. in 2005 (last year’s event was rained-out). Castroneves has won it four times overall, including 2002 – when he won his second Indy 500. 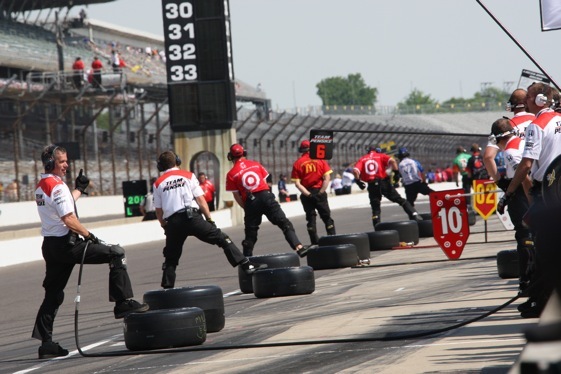 Overall, the winner of the Pit Stop Challenge has gone on to win the Indy 500 five times – including Penske drivers Bobby Unser in 1981, Danny Sullivan in 1985 and Castroneves in ’02. Rinaman also credited Castroneves providing the precision – and an intangible – required for each stop. Castroneves noted that some members of this crew have been with him for 10 years.